This is the 9th in the series How to Get Pregnant Fast. 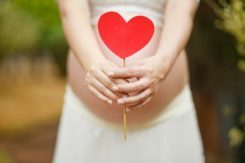 This article is about getting pregnant over 35 years and why you do not need to worry that you have left it too old to conceive, even if you are over 40. I had 4 children over the age of 35, the last one at 44! 1. Most of the data is based on church birth records in rural France between 1670 and 1830 when life expectancy was shorter and modern medicine, antibiotics and indoor plumbing amongst other things, didn’t exist. 2. A more recent study (1990) found that 50% of 35-39 year olds were pregnant after 3 months of trying to conceive, 82% within a year and 90% after 2 years. 3. A 2013 study found that of women aged 40-43, 60% got pregnant within 6 months. 4. In the 1920s the average age that a woman gave birth to her last child was 42. It is the baby boomers that have skewed our perception on age and fertility. 5. In the past it has been thought that we are born with all of the eggs cells we will have for the rest of our lives, hence the reason age can have such an impact on egg health. Recent research has found that women may produce eggs throughout their reproductive years. 6. Both environmental and genetic factors contribute to depletion of the egg pool and reduction in egg quality, meaning that biological and chronological ovarian age are not always equivalent. So even if you are a bit older this is only half the story. Your chronological age can be manipulated through diet, lifestyle and Chinese medicine. 7. IVF favours younger women as it works best if the ovaries produce a lot of eggs at once and as this is less likely if you’re older the data here is less encouraging. However, don’t be discouraged, if you can rule out tubal and sperm issues, your best chance of conceiving is naturally. The further past 35 you are the longer it may take you to get pregnant so use the wisdom those extra years have given you to measure your expectations, cultivate patience and most importantly, do not lose hope just because it is taking longer than you would like. For more reassuring facts about conceiving over 35, particularly if you suffer from Polycystic Ovary Syndrome, check out my book. Good Luck with your fertility journey!